When legendary performer Frank Sinatra died in 1998, he paid alcoholic beverages maker Brown-Forman Corp. the highest compliment: he was buried with a flask filled with their Jack Daniel’s whiskey. Mr. Sinatra, according to Brown-Forman and the family estate, was a devoted fan of Jack Daniel’s for decades during his lifetime. He was first introduced to the whiskey in the late 1940s, and Brown-Forman credits Mr. Sinatra’s unofficial endorsement as an important factor that propelled Jack Daniel’s to become a nationally recognized brand. 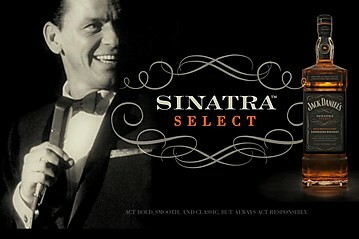 Brown-Forman, which currently sells just four versions of Jack Daniel’s, recently began to sell a special edition called “Sinatra Select” in honor of the artist’s close ties to the brand. “This really honors what he meant to the brand,” Jack Daniel’s Master Distiller Jeff Arnett said. With a suggested retail price between $150 to $175 for a standard 750 milliliter bottle, Sinatra Select is among the priciest American whiskeys. Though super premium spirits like Sinatra Select make up just 8% of total U.S. spirits volume, growth for the pricier beverages outpaced more affordable spirits last year, according to the Distilled Spirits Council of the United States.